Exploring inclusive arts practice and how this feeds back into artists’ creativity. 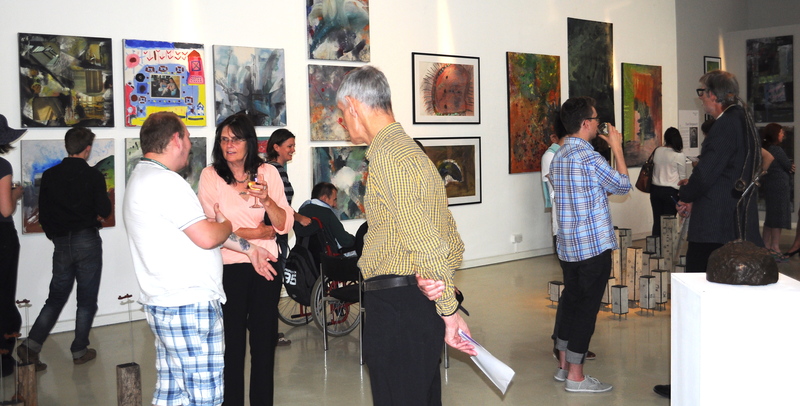 Incredible and diverse Exhibition of about 120 artworks by facilitating artists and their participants. More than 250 people attended the opening celebration of the ‘private view’, enjoying the diverse show by buffet, drinks and music from the band ‘Whats left of the Whisky’, which even encouraged some visitors to dance! Discussion forum exploring aspects of mutual relationship and creative benefits for facilitating artists and participants. Inclusive Saturday workshops: making giant mono-prints with a ‘Steam’- roller. Professional development opportunities for our highly engaged volunteers.